Tutubi's "last resort" for the summer, where he booked at the last minute turned out to be a place he's been to before years ago: Overlook Resort and Conference Center. Located on the famous overlooking hill facing Metro Manila, similar to Cebu's Tops and Davao's Jack's Ridge, Overlook Resort in Antipolo offers a respite, at a budget, to city dwellers looking for a break from the hustle and bustle life in the big city. the facade of the resort on the hilltop overlooking Metro Manila. 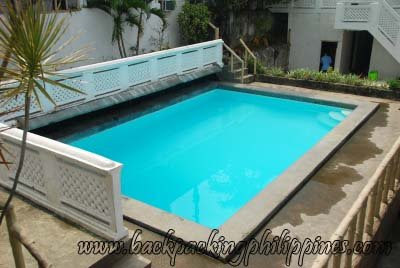 one of the resort's two swimming pools. 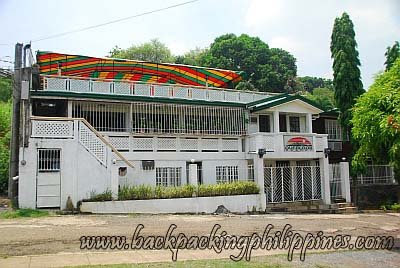 The rooms are nice and basic amenities at the price range (P1500/night for twin sharing) so don't expect the comforts of high-end resorts city slickers are accustomed to. The resort's food don't have many choices, mostly tapsilog stuff, and targeting budget travelers. They don't have food stocks and limited menu. You can bring your own food and just use the facilities should you wish. The nearest restaurant is Vieux Chalet, Swiss-themed restaurant higher up the hill, but such a pricey restaurant. Like many other resorts out there, there is a distracting karaoke with songs belted out by other resort people unmindful of other visitors. If you want peace and tranquility, this resort is not for you. Map and driving directions on going there posted on the resort's official website here. It's not easy to commute there owing to the hilly terrain and tricycles are the only mode of transport from the corner of Taktak road and Sumulong Highway. I'd passed by the place before but wasn't able to see what's inside. It doesn't look very attractive to me. we went there last year.. the resort is undergoing a renovation that time.. the rooms are good but their cr has a drainage problem.. no cafeteria at that time.. the pools are clean and good to swim to.. their rate doesnt give justice to what they can offer to their customers.. its good to know that they have wifi at least.. they should lower their rate if they cant provide good accomodation for their guests however im looking forward to go there again..expecting a better resort this tym since they are newly renovated..
Hi guys. I am enjoying my long postponed balikbayan tour here in the Philippines. Right now I am in beautiful Antipolo with my high school and college buddies. We are resort hopping sampling all the sights and fares. Last week we stayed at Overlook Resort and Bosay Resort. We were a big group of twenty. Bosay is big but super crowded. Parking was a disaster. Plenty of pools but with so many people in the water, the pools was kind of dirty. Overlook is smaller. There are only 4 pools. Parking was good. View is great. Staff excellent. Pool water was clean. Kelangan pala frequent filtering, otherwise madali lumabo. Ang tubig. Well we enjoyed our swimming kainan, inuman and great companionship. Nothing better. Sayang, I have to go back to school in the good old USA.